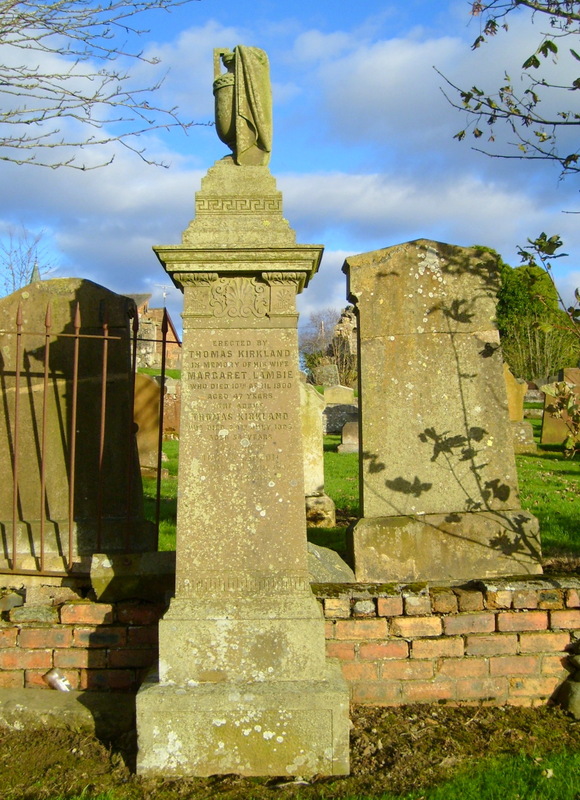 Thomas and Jean Kirkland along with family moved form Sorn in the 1830s’ and settled in New Cumnock. Two of their sons Alexander and Hugh quickly established themselves as leading merchants in the town with general stores, a grocery and a bakery. In 1850 the brothers created the New Cumnock Gas Light Company and, erected gasometers and pipelines to service houses from Afton Bridgend, along the Castle and to Mansfield. Their sister Agnes married John Hyslop of Bank, one of the leading coal barons in the parish. Hugh married Catherine Rankine Campbell, daughter of James Campbell , road surveyor (son of William Campbell of Dalhanna) and Elizabeth McKnight (daughter of John McKnight of the Old Mill) and Alexander married Mary Ferguson. Alexander and Mary had two sons and a daughter – Alexander Peden, Thomas and Mary. Alexander Peden lived for some time at Demerara, Georgetown in what was British Guiana, South America). From here he would ship back the treacle (produced from sugar cane) as well as the brown Demerara sugar to his father’s store in New Cumnock. Treacle was one of the best sellers in the Kirkland’s shop, used to sweeten breakfast porridge as well as a spread for bread. Alexander Peden Kirkland died in Demerara in 1871, aged 31 years and is remembered on the tombstone of his sister Mary Kirkland (b. 1847, d 1877), wife of James Gibson, located within the ruins of the Auld Kirk. Second son Thomas married Margaret Lambie, daughter of a farmer from Calderhead, Shotts. Alexander Kirkland, following the death of his wife, married Hellen Hallady and together they had a son John Kirkland. Following her death he married for a third time, to Margaret McNaught. Thomas married Margaret Lambie (Lammie) the daughter of Thomson Lambie (who formely lived at Sunnyside near Lanehead, but now farmed in Cambusnethan, Lanarkshire0 and Jean McKnight. Together they has a daughter Jane and a son Alexnader. “A small out of the way place like New Cumnock has in a shop the newly invented Harvey’s sewing machine. If the old people could come back they would think it was witch-craft’. Many other people served their apprenticeships with the Kirkland’s before starting their own businesses, including the Trotter family. Thomas was at the forefront of raising subscriptions to have gas-lit street lamps erected in the village. ‘Was it true a small band of Wallace’s men watched from Lowesmuir while he, in disguise, passed the English garrison, who were outside the fosse, enjoying a game. With the strength of four men he drew the drawbridge, then blew his horn, when his men came down and enacted the last chapter of the short struggle? Thomas’s son Alexander continued to work in his father’s business as a draper. Sadly in 1928 the Kirkland premises burned to the ground. Alexander married Agnes Campbell in the Arthur Memorila Church. He died in 1951 at Polmarlach his house in Afton Bridgend (Coupla Leggate). Headstone of Thomas Kirkland and Jean Peden (who died in Bank House, New Cumnock) in Sorn Kirkyard. Son Hugh Kirkland and his wife Catherine Campbell rest here too. Jean Peden was the daughter Alexander Peden, farmer in Sorn and Jean Smith. Could there be a connection with Alexnder Peden, Prophet of the Covenant? Another Covenanting link is through Margaret Lambie, wife of Thomas Kirkland. Her grandmother Margaret Lammie was the mother of the celebrated poet James Hyslop, his best known work ‘The Cameronian’s Dream’, inspired by the loss of Richard Cameron ‘Lion of the Covenant’ and his band of Covenanters at the battle of Airdsmoss (1680).